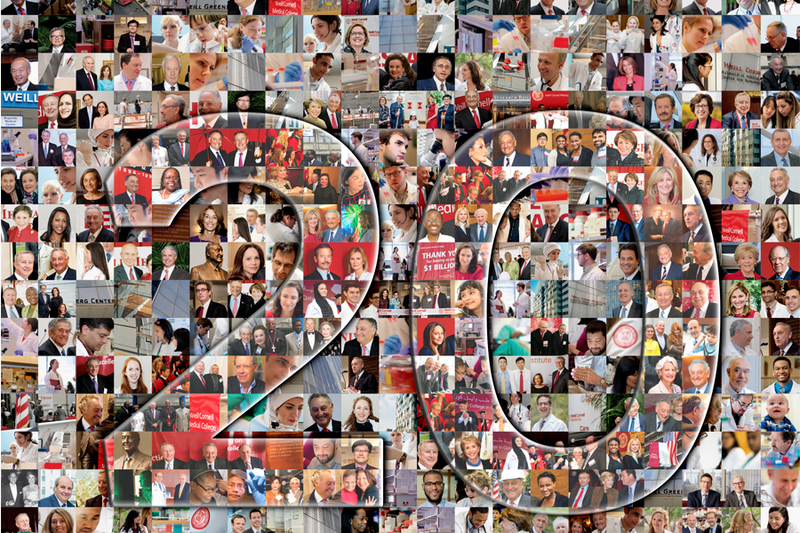 Twenty years ago, Weill Cornell Medicine took on the name of Joan and Sanford I. Weill, and launched a bright, new era of dynamic expansion, successfully propelling the institution to its position as a formidable leader in global healthcare. With extraordinary donor support and strong leadership from the Board of Overseers, a series of well-executed strategic plans and groundbreaking initiatives – powered by a transformational gift and the renaming of the institution in 1998 – have placed Weill Cornell Medicine at the forefront of biomedical science, medical education and patient care. Weill Cornell Medicine’s compassionate, exemplary clinical care has always been at the heart of its mission – with physicians, researchers and educators collaborating to accelerate the pace of healthcare breakthroughs and improve patients’ lives. Over the past two decades, Weill Cornell Medicine has dramatically expanded its clinical footprint and extended the range of services for patients, with more than 1,300 physicians currently providing care through 18 academic clinical departments at over 40 sites in New York City. The highly successful Advancing the Clinical Mission campaign – launched in 2002 and completed in 2005 – raised $750 million and provided for construction of the Weill Greenberg Center, the institution’s flagship ambulatory care facility at East 70th Street and York Avenue, which opened in 2007. The building, funded wholly by philanthropy, was named in honor of benefactors Joan and Chair Emeritus Sandy Weill and Overseer Maurice and Corinne Greenberg, who collectively donated over $175 million to that campaign. Exemplifying the robust academic clinical mission at Weill Cornell, the 13-story facility consolidated numerous clinical programs under one roof, providing patients with access to primary and specialty care, as well as imaging. The building also houses the Margaret and Ian Smith Clinical Skills Center, an advanced teaching center for medical students. As services for patients continued to expand, Weill Cornell Medicine – in partnership with NewYork-Presbyterian – broadened its reach throughout Manhattan and into Brooklyn and Queens, and added more than 550 physicians, 140 of them practicing at NewYork-Presbyterian/Lower Manhattan Hospital. The institution’s worldwide network of collaborators also includes the GHESKIO Centers in Haiti, Weill Cornell Medicine-Qatar and global health programs on six continents. Over the past two decades, the research enterprise at Weill Cornell Medicine has expanded significantly, with increasing numbers of physicians and scientists working to speed the most innovative discoveries to patients in need. Weill Cornell Medicine’s collaborative programs and talented faculty continue to attract leading investigators dedicated to improving human health through cutting-edge translational research. Weill Cornell Medicine’s vision for a 21st-century research enterprise gained momentum with Discoveries that Make a Difference, a campaign that ran from 2006 to 2013 and raised $1.3 billion, laying the foundation for unprecedented growth. The campaign was marked by the Weills’ transformative gift of $250 million, as well as gifts of $1 million or more from 154 other donors. The centerpiece of the campaign was a state-of-the-art translational research building that would encourage interdisciplinary collaboration. That 18-story facility, which opened in 2014, was named the Belfer Research Building in honor of Overseer Robert and Renée Belfer, who donated $100 million toward its construction and related programs. The structure – adjacent to the Weill Greenberg Center – has facilitated Weill Cornell Medicine’s bench-to-bedside efforts, helping speed newly discovered therapies to patients. Overseer Maurice and Corinne Greenberg and The Starr Foundation also donated a total of $100 million toward construction of the research facility – and were honored with the naming of The Starr Foundation-Maurice R. Greenberg Conference Center, which spans the second and third floors of the Belfer Research Building. The Greenbergs and The Starr Foundation have a historic partnership with Weill Cornell Medicine that includes more than $330 million in critical philanthropic support for medical education, scientific innovation and clinical care over the past three decades. The Belfer Research Building contains 13 floors of laboratories with numerous research hubs that focus on making the groundbreaking discoveries that can make a critical difference in patients’ lives. Key institutes and centers developed during this period include: the Helen and Robert Appel Alzheimer’s Disease Research Institute, the Gale and Ira Drukier Institute for Children’s Health, the Caryl and Israel Englander Institute for Precision Medicine, the Feil Family Brain and Mind Research Institute, the Sandra and Edward Meyer Cancer Center, the Jill Roberts Institute for Research in Inflammatory Bowel Disease, the Joan and Sanford I. Weill Center for Metabolic Health and the Cardiovascular Research Institute. More than 70 senior and early-career investigators have been recruited since the opening of the Belfer Research Building, leading to an approximate 25 percent increase in sponsored research funding at Weill Cornell Medicine. The expanded capabilities in the Belfer Research Building have ushered in a new era in research, with computational biology and precision medicine playing an increasingly important role in developing targeted therapies for patients. In addition, Weill Cornell Medicine has implemented a range of initiatives that foster entrepreneurship and promote alliances with the biopharmaceutical industry. Those initiatives include the Tri-Institutional Therapeutics Discovery Institute (Tri-I TDI), an alliance among Weill Cornell Medicine, Memorial Sloan Kettering Cancer Center and The Rockefeller University, in partnership with Takeda Pharmaceutical Company (housed in the Belfer Research Building), which expedites early-stage discoveries into therapies for patients. The Daedalus Fund for Innovation – launched by the Office of BioPharma Alliances and Research Collaborations and supported completely by philanthropy – also helps accelerate early-stage research projects by providing needed funding to investigators. Weill Cornell Medicine is one of the leading medical schools in the United States, producing accomplished academic physicians who advance medicine through research. With its award-winning faculty, a state-of-the-art clinical skills center and a new curriculum that uses innovative teaching methods, Weill Cornell Medicine is continuing to build upon its position as a premier academic medical center that provides a world-class education to the next generation of physician-scientists. Weill Cornell Medicine and Cornell University established a global presence in medical education when Weill Cornell Medicine-Qatar (WCM-Q) launched a pre-medical program in Doha, Qatar in 2002 and opened its doors to medical students in 2004. Enrollment at WCM-Q has grown rapidly, from 25 first-year pre-medical students in fall 2002 to 280 students from more than 30 countries in 2017. WCM-Q graduated its 300th medical student last year. Medical Seminars and the Open Medical Institute in Austria. Education, announced in 2014 and concluded in 2017, surpassed its fundraising goal, generating nearly $69 million for curriculum reform, education endowments, student scholarships and facility enhancements, including a new 16,200-squarefoot student center made possible by the Feil family’s gift of $12.5 million. The Feil Family Student Center, currently under construction on the main campus, will expand the institution’s dedicated student space by nearly 75 percent. A new curriculum, which debuted in the 2014-2015 academic year, focuses on increased patient interaction and innovative learning methods, broadening the medical school experience as it prepares future physician-scientists to be global healthcare leaders.